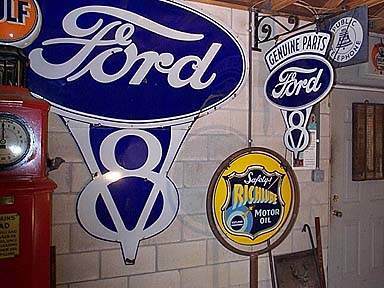 These are some of my best and favorite items from my personal collection of vintage Ford items. 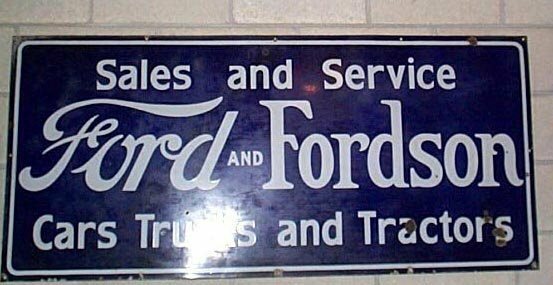 Ford Sales & Service, Cars Trucks Tractors - Blue and white porcelain. 27" x 60". From the 1920s. 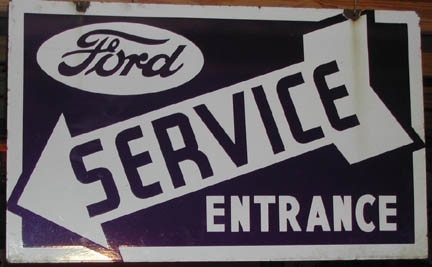 Ford Service Entrance - 'Ford' written in oval, 'Service' written in arrow. Blue & white 2 sided porcelain. 36" x 22". From the 1930-40s. 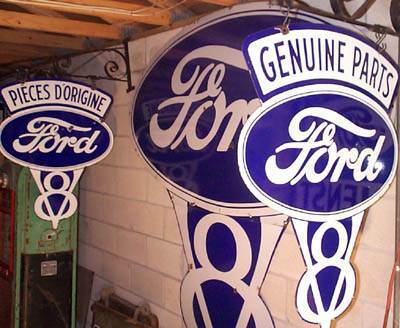 Genuine Ford Parts Used Here - 1 sided blue and white porcelain. Solid blue porcelain on the back, marked 'Burdick-Chi' 26" x 9-1/2". From 1920s. 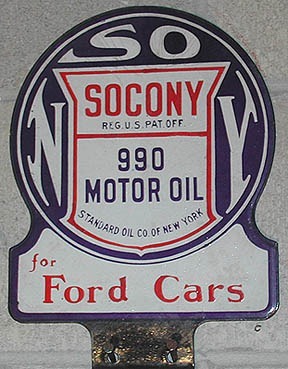 Socony Reg. US Pat Off. 990 Motor Oil. Standard Oil Co. of NY. For Ford Cars - Black, white and red, 2 sided porcelain. 8" x 12". From the 1920-30s. 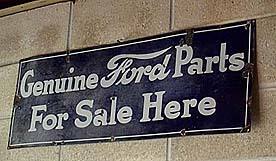 Genuine Ford Parts Sold Here - 1 sided blue and white porcelain. Marked 'Veribrite Signs, Chicago' 9-1/2" x 25". From the 1920-30s. 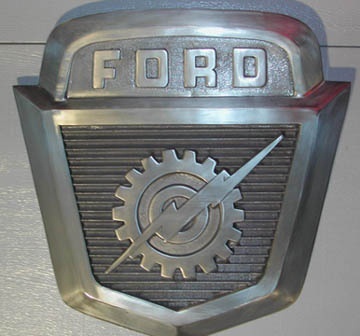 Ford Crest - heavy aluminum Ford truck crest. 21" x 21". 1954-60s. 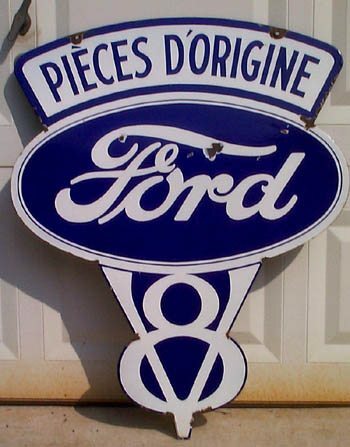 Ford The Universal Car - Diecut winged pyramid shape. 2 sided, blue and white porcelain. 29" x 12". From 1915 to 1920s. Ford Sales & Service - Diecut winged pyramid shape. 2 sided blue and white porcelain. 29" x 12" AD.110. 1915-1920s. 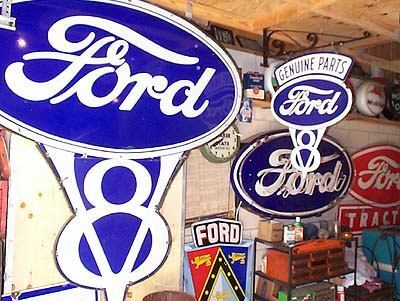 Sales and Service Licoln, Ford, Fordson Cars-Trucks-Tractors - 1 sided blue and white porcelain. Marked - 'Burrick Consumer Bldg. Chi & Balt.' Sign is 65-1/2" x 27". 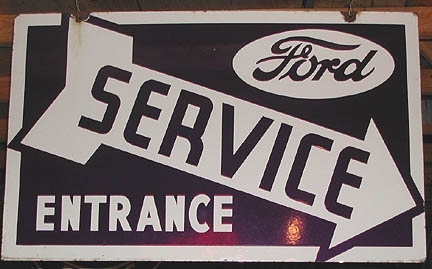 Ford Authorized Sales and Service - 1 sided blue and white porcelain, 72" x 35". 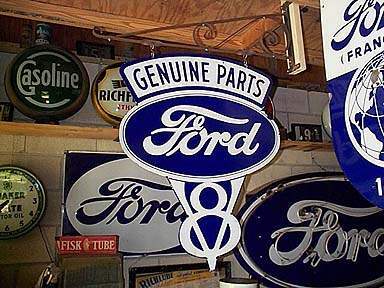 Genuine Ford Parts For Sale Here - 1 sided blue and white porcelain. 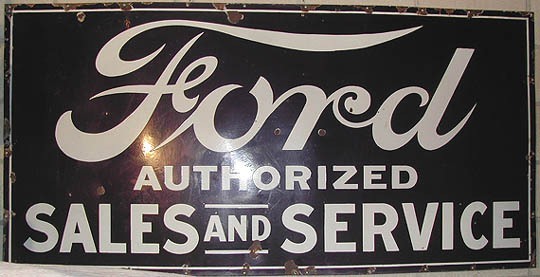 The back is grey porcelain and it is marked - 'This sign is the property of the Ford Motor Company of Canada Limited Ford Ontario supplied by Marsh Bros. Toronto, made in USA'. The sign is 35-1/2" x 12-1/2". From the 1920-30s. 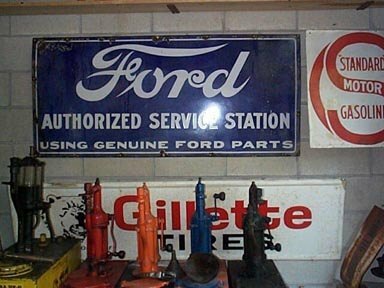 Ford Authorized Service Station using genuine Ford parts - 1 sided blue and white porcelain. 60" x 27". 1920s. 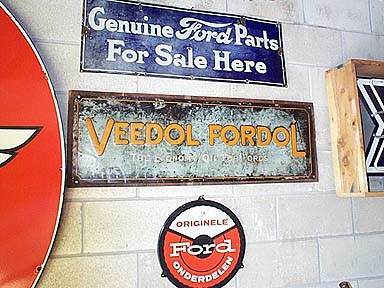 Veedol Ford The economy oil for Fords - 1 sided black and orange painted tin with raised letters. 41-1/2" x 13-1/2". 1920-30s. 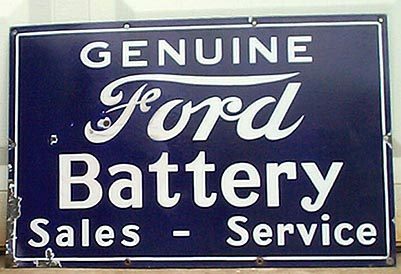 Genuine Ford Battery Sales Service - 1 sided blue and white porcelain. The backside is white porcelain. 23" x 15". 1920-30s. 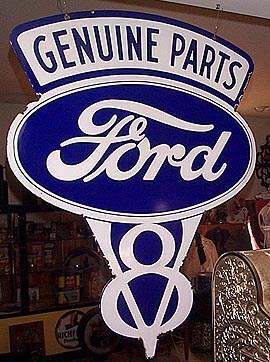 Genuine Ford Parts - Ford in center of winged pyramid. 2 sided Black and white painted wood sign. 1920s. 30-1/2" x 11-1/2"
Ford Authorized Service - 2 sided blue and white porcelain. A.D. 106. 28" x 9". 1930-40s.